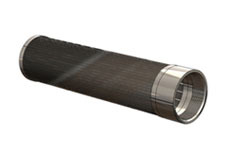 AMACS wedge wire water well screens provide reliable filtration for a wide range of well completion and work over operations. 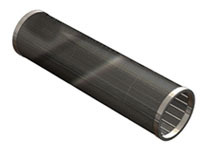 Our screens are constructed with a continuous “V” shaped wire wrapped around, and welded to, perpendicular support rods with a specific slot opening for high intake efficiency. The result is a smooth plug-resistant surface that is also structurally sound. 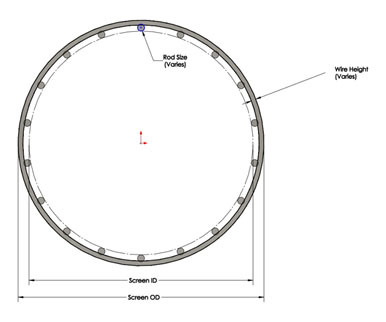 AMACS screens are available in diameters ranging from less than 1” up to 30” in diameter. The gap or slot openings are selected based on the customer’s requirements. With a variety of wire shapes and sizes available, the correct combination is available to meet the open area and strength requirements for the particular application. As a custom fabrication shipment, we are able to supply a variety of fittings for well screens. Typical requests include end plates, weld rings, flush joints and NPT threaded joints on these screens.